Welcome to another week of Trash 2 Treasure! Did you miss what I shared last week? I would feel right at home in this cozy guest room makeover by Leroy Lime. Unique Junktique really did a cool thing turning an old wood desk into a faux metal one! Just TWO rules to follow! 2. Place the Party button found on the right sidebar somewhere on your blog - doesn't matter where. Hi Kammy, thank you for Trash 2 Treasure Tuesday. Love joining in and visiting. Have a good week. Thanks so much Kammy for the honor of featuring my desk this week, so glad you enjoyed my project! 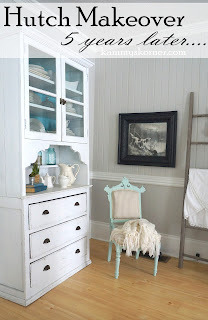 Thank you for featuring my guest room this week, I may have squealed a bit! :) Have a wonderful week! Thank you for the party Kammy! Thank you for hosting the party, Kammy! Hi Kammy, I'm so glad I found your party - I'm showing you how I updated my freebie shelf my husband brought home. Thanks for hosting! Thanks for the party Kammy! !